From the very beginning of our homeschooling adventure, I had kids who would outright refuse to write anything creatively. When I brought out a writing assignment, they would groan and sometimes even have meltdowns. You see, they had spent years in school being told to write in a particular form with a particular set of rules. By the time we started homeschooling, they were over it. No one but the baby (who was new to school) wanted to spend time being forced to write another boring essay. So, I had to come up with something new to get their creative juices flowing and to keep the meltdowns at a minimum. It was about that time that I was introduced to Brave Writer. This relaxed homeschooling lifestyle appealed to the beleaguered homeschool mom in me, and the writing philosophy was so different that I thought that it just might work. We started with Freewriting and didn’t look back. There is a peculiar kind of magic that happens when you freewrite with your kids. Somehow the frustrations of the day disappear, and you enter a world of imagination — even if it’s only for 10 minutes. There are simple rules to freewriting according to Julie Bogart of Brave Writer. The most important of these are keep your pencil moving and don’t stop for anything – not a misspelled word or misplaced comma. Just keep going. This isn’t time for revision or perfection. It’s a sort of brain dump — just get everything you are thinking on paper. Freewriting should be fun and creative, not critical. The more straightforward the task, the easier it is to accomplish. This philosophy applies to freewriting as well. We keep freewriting simple which allows the kids more freedom to think creatively. All you need are a few tools to get started freewriting. We start with some inspiration. Inspiration can really be anything. Most recently we used the Keen Observation activity in chapter 3 of The Writer’s Jungle. I gave each child a bag with an object inside. They had to reach in and feel of it and write down their observations. 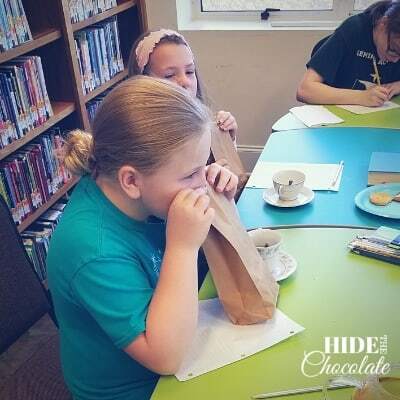 Next, they smelled inside the bag and again wrote down their observations. Then they were allowed to remove the object from the bags and use the last three senses to describe their mystery object. Then it was time for the freewrite. 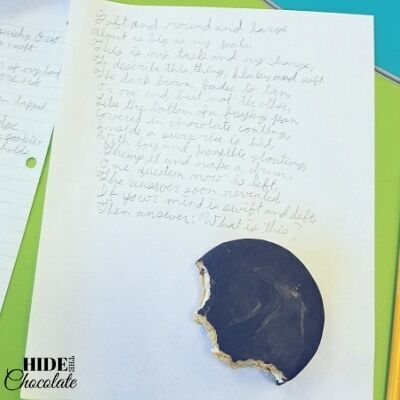 They used the descriptions they had added to their papers to create a story, poem or just a paragraph describing their new treat. Some were reluctant to write their thoughts. But, the rules were simple: Write until the time is up and write anything. 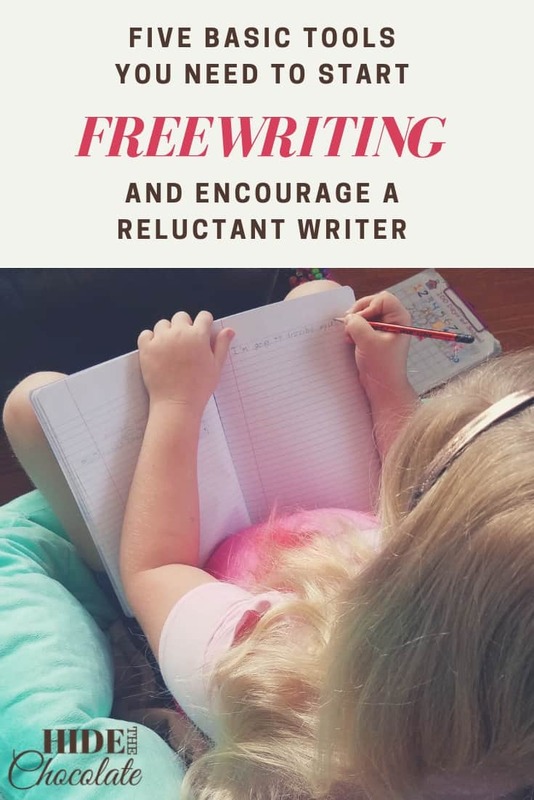 The reluctant writer started with, “It’s yucky.” But, she didn’t stop writing and eventually had a page of why she hated her particular treat. About as big as my palm. To describe this thing, flaky and soft. With joy and possible gloating. Thump it and make a drum. One question now is left. It’s amazing what talented poetry can come from a simple freewrite. The next tool you need is time limits. When a reluctant writer is told they must come up with something creative from their brains, it can be overwhelming. Starting with a finite time can help reduce the stress, especially if the time is short. We started with 5 minutes and have now increased to 10 minutes. This is the maximum time a child has to sit and write. However, they are always free to continue writing as long as they want. Often, they get carried away and keep writing for much longer. The easiest way I’ve found to encourage the kids to write is if several people are writing together. When we are at home, this means we all sit down to write — including mom. There is less whining because everyone is participating. In a group setting, like at Poetry Teatime, the kids are encouraged by each other. They see the excitement on another child’s face as they write about something inspiring to them. Others participating in the same practice motivates them to keep going. Writing can be done anywhere, but we all know that writing comes more naturally when your mind is clear, and you feel comfortable. For some of my kids, this means going outside so they can feel the wind and sun on their faces. For others, it’s a soft blanket in a comfy chair. Regardless of where the writing is, make sure the atmosphere is inviting with few distractions. Pretty notebooks, colorful pens, bright papers — whatever it takes to make your child want to start writing works. Some of mine like to write with pencils only. Some like to write with pens. And, don’t get me started on how many journal/notebooks we have in this house. We like pretty pens and stationery. As long as it works, I’m all for buying a pretty notebook to get my kids’ thoughts on paper. There are thousands of creative writing prompts out there in the world to choose from, but I am partial to those that lean more creative. Here are some of our favorite ways to start a freewrite. Have you ever gotten up super early in the morning to do something? What did you wake up for and was the experience worth it for you? Explain why or why not. Take risks, blow up words, and leave a happy mess behind you in the wake of your incredible bursts of writing energy! Critical thinking matters, especially when it comes to defending convictions and upholding the truth. Here’s what it means to think critically, plus 17 writing prompts to encourage critical thinking. You know what you believe, but do you know why you believe it? What about people who disagree with you? I may receive commissions for purchases made through links in this post. inside: 25 creative writing prompts to use in your homeschool Getting kids to write is challenging. They loathe the topics you recommend. History is boring. Science dull. Why can’t you give them something different to write! Add some fun and creativity to your writing lessons with this great writing jar! Get kids excited about writing with 101 free fun, thought provoking, and exciting printable writing prompts! “Mother, I know how to write.” That was the response I got from my 13-year-old when I said we needed to incorporate more writing into our homeschool. Thanks, Lee Ann! You are so right. Some of my best writing comes from freewriting.